A beautiful sunset and summer spins on top! No one wants the sun to ever go down on a beautiful summer day – unless the sunset brings up to 100 Free Samba Sunset Spins! A gorgeous and rich sunset is in sight this summer with your chance to redeem Free Spins twice per day throughout the month of July! Samba Sunset takes you on a colorful adventure of skimpy dresses, crazy inspired outfits and many winning odds! 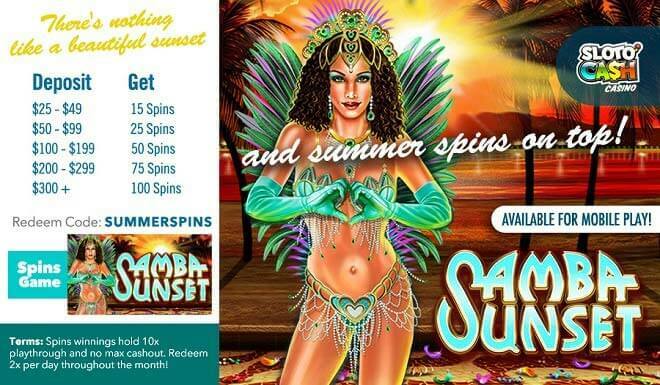 Warm weather, longer days and incredible sunsets are happening this July—and these days will be especially beautiful when you add Mr. Sloto’s Free Spins!